Java and High Level Assembler (HLASM) are often regarded as the Montagues and Capulets of z/OS. However there are occasions where you need to call an HLASM program from Java. This article shows how. High Level Assembler (HLASM) has been around in one form or another from the birth of the z/Series mainframe. And because of this, there is a huge amount of legacy HLASM code still being used by mainframe users. What's more, there are still some things that are best done in HLASM - from z/OS user exits to performance critical code. Java is almost the exact opposite. The new kid on the block, Java on z/OS has yet to gain much traction. However Java programmers with no z/OS experience can now develop new code, and even port existing programs to z/OS. This makes Java a very appealing option. There is an existing HLASM routine that you want to call from Java. You need to call another z/OS routine, and need an HLASM routine to sit in-between to handle incompatible parameters and environments. You need to get some z/OS information that isn't available to Java. You need to do something that you can't do in Java. This routine will be called from a Java program that provides a parameter. This parameter will determine whether the host name or Sysplex name is returned. The Java Native Interface (JNI) routine: JNIzOS.c - written in C.
The Java program zOSInfo - providing the classes needed to call our interface. The Java program callHlasm- a program to test our interface. HOST - requesting the z/OS host name. SYSPLEX - requesting the Sysplex name. If neither of these values is present, the routine will exit with a return code of 8. The routine will insert the host or Sysplex name in this same area, and will exit with a return code of 0. CVT (Common Vector Table) to get addresses of other control blocks. ECVT (Extended CVT) to get the Sysplex name. SMCA (SMF Control Area) to get the host name. More information about these control blocks can be found in the relevant IBM z/OS Data Area manuals. The program starts with the EDCXPRLG macro and finishes with EDCXEPLG. These macros are similar to the Language Environment (LE) CEESTART and CEETERM macros, and are documented in the IBM z/OS C/C++ Programming Guide. Our module passes the return code back in R3, which is returned to C.
This is identical to ASMINF except for the CELQPRLG and CELQEPLG macros (and the 64 bit load of the parameter address). These macros do exactly the same job as EDCXPRLG and EDCXEPLG - and their parameters are the same. They are documented in the IBM z/OS Language Environment Programming Guide for 64-bit Addressing Mode manual. The 31 bit ASMINF has been coded to be 64 bit compliant in all other ways. For example the LLGT instruction has been used instead of LA when loading the (31 bit) pointers to the ECVT and SMCA control blocks from the CVT control block. Because ASMINF is an XPLINK module it needs to be a DLL. This means that we will be assembling with the RENT and GOFF HLASM options. If ASMINF is going to be called statically then there's no need to bind it - that's done when binding JNIzOS. However if called dynamically then it must be bound as a DLL, and you must save the side file for use with JNIzOS. 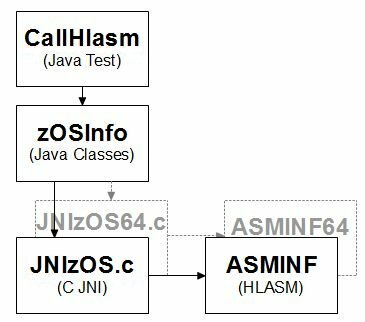 JNIzOS is a C program that sits between our Java classes and ASMINF. It accepts a string parameter from Java, passes this onto ASMINF, and passes back the value returned by ASMINF. If the return code from ASMINF is not zero (meaning that an error has occurred), then JNIzOS returns the string "(invalid)" to its Java caller. It uses the __atoe and __etoa functions to convert between EBCDIC and ASCII. These functions use the default Locale. We convert the parameters passed from Java to EBCDIC, and the values from ASMINF to ASCII. It does a standard call to the HLASM program - using the _LP64 macro to determine which HLASM program to call, the 31 or 64 bit version. JNIzOS64 - 64 bit version. We can use the same code, but use the LP64 compiler option for the 64 bit version. As JNIzOS is an XPLINK module, the XPLINK compiler option must be used. is needed. Without this, our Java class won't find the zOSInfo function. ASMINF must exist in a place that can be loaded by JNIzOS. Or in other words, in either the z/OS linklist, STEPLIB or libpath. Because this can at times be difficult and prone to errors, it may be more robust to statically call ASMINF. JNIzOS must be bound as an XPLINK dll. If running Java SDK 1.5 or later, the module name JNIzOS is fine. However if we are running an earlier Java SDK, this name must be in the format libxxxxx.so - for example libJNIzOS.so. JNIzOS and JNIzOS64 must be bound into a USS directory in the Java libpath. It cannot be bound in the z/OS linklist or STEPLIB - Java won't find it. You can get around this is by defining an external link in the USS directory that points to the module in the z/OS linklist or STEPLIB. The USS ln command can do this. zOSInfo holds the classes connecting to our JNI module. Standard Java code, it uses the system property com.ibm.vm.bitmode to determine if running in 31 bit (the value is actually 32) or 64 bit mode. If running Java SDK 1.5 or later, the more standard sun.arch.data.model property can also be used here. JUNK - an invalid parameter. Our program will return "(invalid)"
To be able to call an HLASM module can be invaluable for Java programmers, and it isn't difficult to do. In fact the most difficult part is probably making your HLASM module XPLINK compliant. Manual: IBM z/OS C/C++ Programming Guide. opinion	: z/OS vs UNIX - Which Comes Out the Winner?